A bad day on the water is better than a good day at work! From gale force gusts to becalmed – a typical autumn rally! We only mustered enough interest in the autumn rally weekend to charter one boat, so the planned ‘Points Makes Prizes’ challenge was postposed until next year. 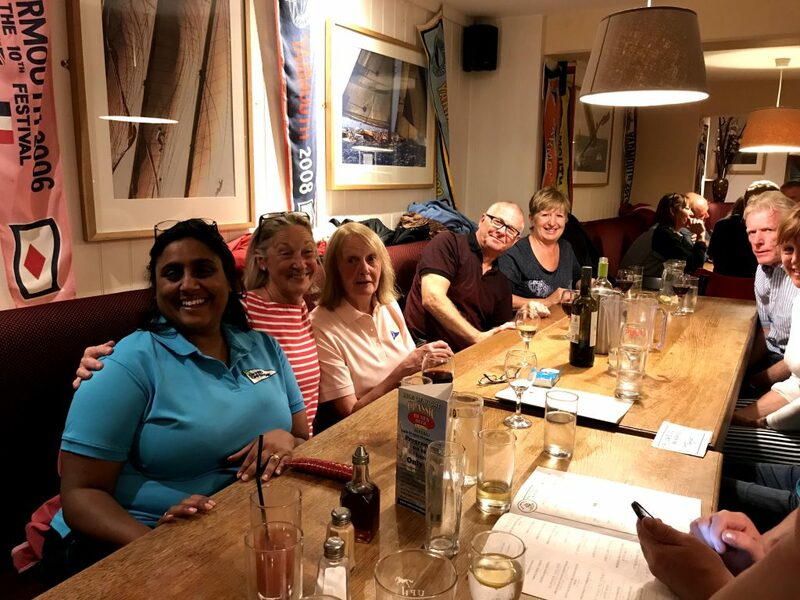 But the nine on board were up for a last sail of the season and we met up at Hamble Point marina on the evening of Friday 6 October and boarded Reunion, a very spacious 46ft Bavaria cruiser. Our crew comprised Jeremy and Catherine, Stuart and Mags, Richard Aust, Kevin Ludbrook, Jeanne Frazer plus Fran and myself. We opted for a fish and chip supper on board, which we picked up from the local chippie in Hamble Point. Unfortunately the supper disagreed violently with Mags who had a bad night and was forced to jump ship early on Saturday morning with Stuart and head for home comforts to recover. I know they were both desperately disappointed and we all hope that Mags is now in tip top condition again. We had a plan for the Saturday. Tides were perfectly timed for lunch at Bucklers Hard, but the weather was far from perfect for a picnic with a brisk westerly of F5 gusting F6/F7, cloud cover and occasional rain. Gossip on the pontoon was that two racing events planned for that morning in the Solent had been cancelled due to the poor conditions, but we knew from Tom Cunliffe’s online video that Bucklers Hard offered amazing shelter so we stuck with our plan, cast off at 10 am and headed out into the Solent. First priority was to decide on sail configuration which is where the novelty of in-mast furling provided an infinite choice! It has the advantage of choosing exactly how much to use coupled with similar flexibility of headsail. The drawback is the friction in the mast created by all that mainsail being wrapped tight around itself. 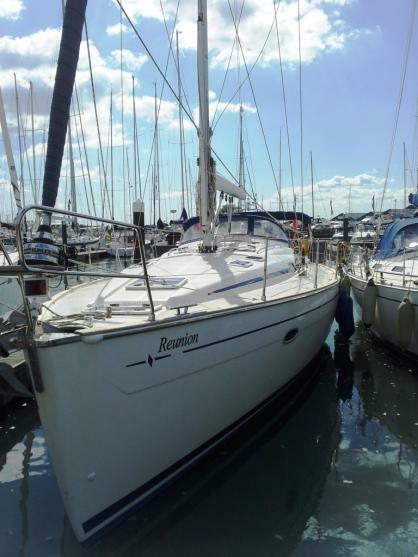 Fortunately Richard was familiar with this problem on other yachts with in-mast furling and recommended a dual effort with him on the mast winch and Jeremy co-ordinating with the outhaul in the cockpit. This seemed to achieve the desired result without undue snagging and locking up. The jury is still out from the point of view of which system works best. But having an experienced crew makes all the difference and from the helm’s perspective, it was an accurate way to achieve steering balance! Slow but stately progress was made against strong wind over tide conditions but after a couple of hours it was time to furl the sails and make better progress to the Beaulieu River. We’d already calculated what time we need to be in the river in order to reach Bucklers Hard, lunch and then head out again in order to cross the bar no later than 3.30 pm. We picked up the heading into the mouth of the river and almost immediately sea conditions changed dramatically and you’d have been forgiven for thinking it was a calm autumn day! 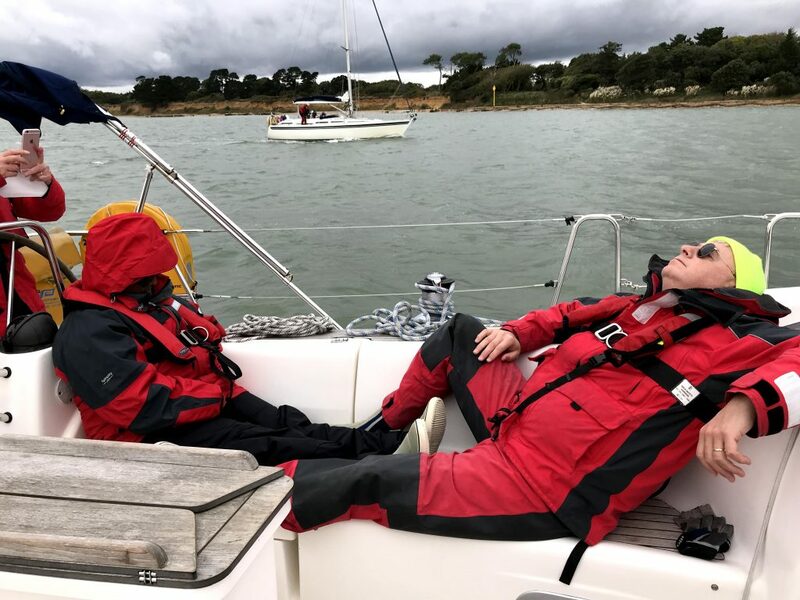 After a gentle motor up to Bucklers Hard we came alongside with no difficulties and promptly celebrated our arrival in time honoured fashion (involving a few cans of ale and a bottle of wine!). Some went for a quick stroll and lunch, which included Kevin’s homemade cheese and Fran’s homemade chutney, went down extremely well! Jane Fowler had arranged to meet us at Bucklers Hard with her Moody 37 called Libra II but we weren’t sure if she would make it. 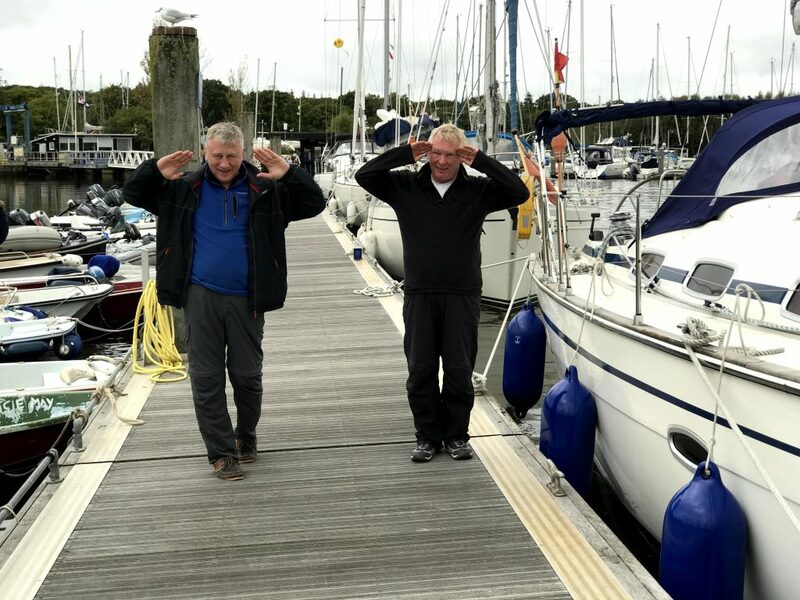 We knew that she had two complete sailing newbies on board with just Phil Brown as nimble crew to assist, so we were delighted when Jane called in to say they were on their way up the Beaulieu complete with her two crazy but adorable dogs on board! Sure enough, about a half hour after our arrival, Jane’s Moody 37 called Libra II was made fast just behind Reunion. Just enough time for Jane’s crew to make some ham rolls while she walked the dogs and then we motored back out of the river together and headed for Yarmouth. Winds were still westerley but fortunately had dropped a little, allowing us to shake out all the sails and clock up some impressive SOG as we tacked down towards Yarmouth. Almost inevitably the passage turned into an impromptu race, with Reunion snatching Libra II’s advantage and then losing it 10 minutes later when Jane tactically denied the tack that Jeremy called for and forced Reunion to back off! 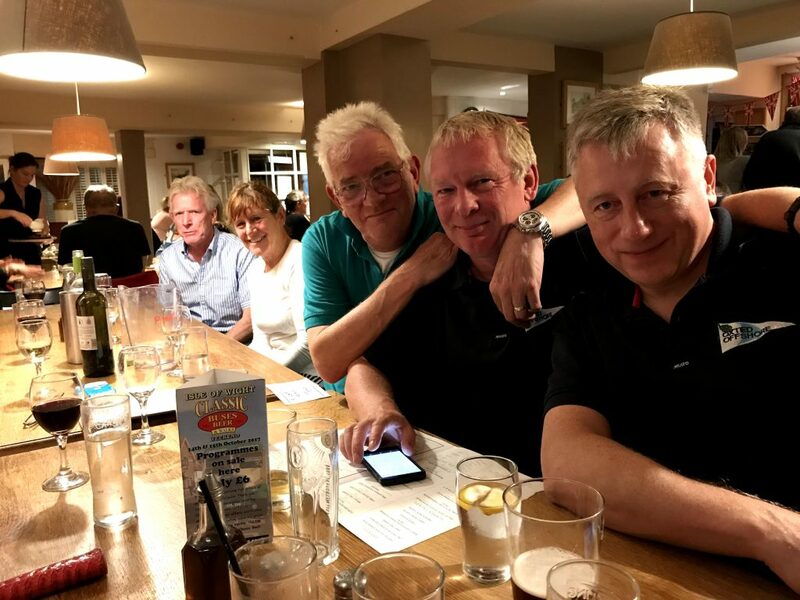 There were, of course, no rules and no finish line and the handicap was blatantly in Reunion’s favour, but Jane put up a spirited fight and the contest was unanimously declared a draw! There are so many great places to eat in Yarmouth but we opted for The Wheatsheaf and had a hearty and really tasty supper which was thoroughly enjoyed by all. Back on the pontoon Jane and her crew joined us on Reunion with a bottle of Jane’s home distilled rum and a masterclass in how easy it is to make your own spirits! We think it very possible that Kevin may now be trying this at home? Daybreak at Yarmouth heralded bright sunshine, beautiful painted skies – and not a puff of wind anywhere! Jane and her crew opted to head for Wootton Creek, but Reunion had a special toy on board in the form of a big blue and white crusing chute! Foredeck preparation was needed, but this turned into an exercise of patiently untangling yards of spinnaker lines stuffed into the bag! Kevin and Richard take full honours for this arduous task that happily proved worthwhile. We opted to motor up past Cowes to fly the chute and were encouraged to see one or two other yachts with colourful balloons on the front mast. At the designated spot the blue and white monster was released with precision and style from its snuffer and we all waited with baited breath. Then the blue and white monster collapsed back on itself. It occasionally responded to a little physical encouragement from Kevin and Richard, and occasionally responded for a few moments when the little wind shifted briefly. But for the most part it flapped forlornly whilst the boat speed varied between 1kt and backwards! The big blue and white cruising chute! It became very obvious that there was no serious playtime to be had on that particular day, but it was fun trying though, and we certainly left Reunion’s cruising chute in a more usuable mode than when we arrived! 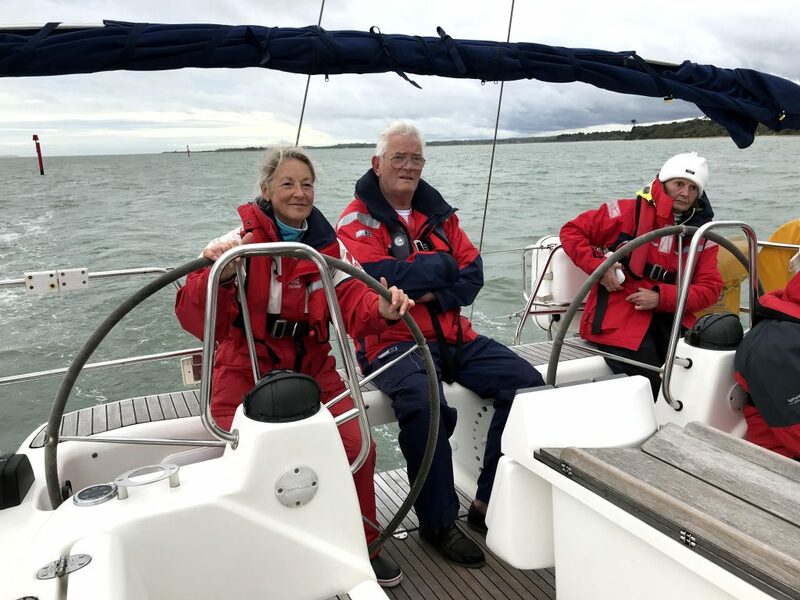 Foredeck playtime was abandoned and we motored back to Cowes and up the Medina to practice close quarter work and boat handling, which was especially enjoyed by Catherine and Jeanne who got to find out how to steer the boat backwards and what happens when you do a hand-brake turn! In common with all charters, time came to end the fun and games at Cowes and reluctantly head back to Hamble Point. Within an hour we had motored across to take her place in the berth outside the offices of Hamble Point Yacht Charters. All agreed that the weekend had been more than enjoyable simply because we had elected to potter about different scenic locations whilst allowing ourselves long overdue practice in fundamentals. Jeremy provided the cherry on the bun by gracefully ferry-gliding Reunion onto the pontoon in masterclass fashion! Footnote: Fran has added furling main sails to her list of “must avoid” yacht features as she would much rather have the option of being able to “drop” the main in an emergency rather than fighting to furl it in! Her list also includes tillers, self-tacking jibs and “JT adverse” low booms! 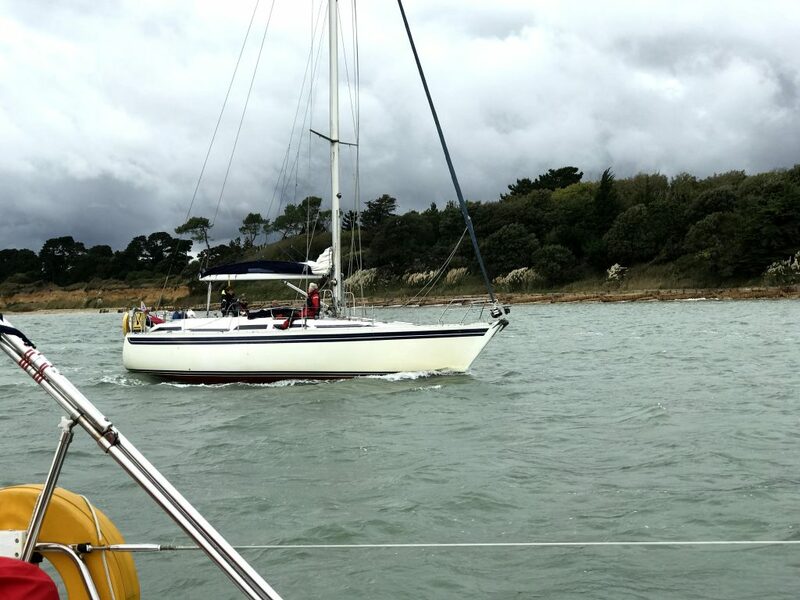 This entry was posted in Past Events and tagged autumn rally, Beaulieu River, Bucklers Hard, Cruising Chute, Hamble, In-mast furling, Isle of White, Libra II, Medina River, Oxted Offshore, Yarmouth by Commodore. Bookmark the permalink. The Cloud Appreciation Society For cloud lovers around the world!